What you see before you are the very first whoopie pies* to come out of my kitchen. What's more, they're the first whoopie pies that've ever passed between my lips. Why have I avoided whoopie pies all my life, you ask? I have no idea. *I've just realized that a simple space and some punctuation will turn whoopie pies into whoo! pie pies!. That makes me chuckle. 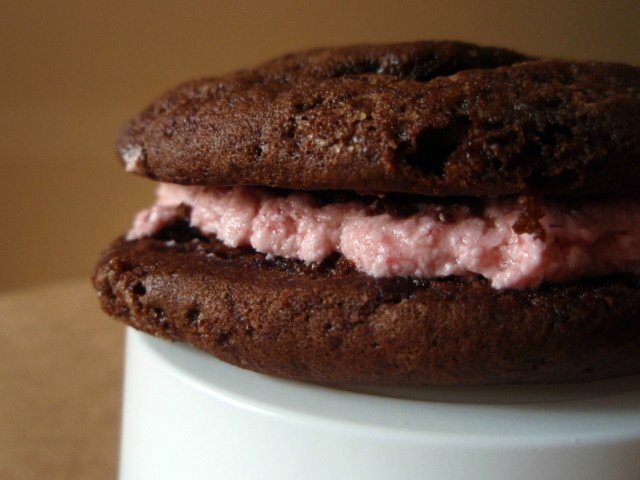 *Whoopie pies can be classified as neither pies nor cookies, in my book. They're more like cake than anything else, and not just because there's frosting involved. *Given my tendency to mix and match, these treats are a dream. Chocolate cookies and chocolate frosting? No problem. Strawberry cookies with vanilla frosting? Delightfully easy. Dulce de leche between coconut cookies? Be still, my heart. *Don't let these sit on the parchment paper too long to cool or you'll make a mess trying to remove them. If it seems like they're sticking, I found that sliding a small off-set spatula underneath worked very well. *You may have to store them in the fridge if they become too tacky at room temperature, but it doesn't affect them negatively at all. Now go make some whoopie...pies. Whoopie pies. Hug a soldier and enjoy your Memorial Day weekend! Preheat oven to 375 degrees F. Line two baking sheets with parchment paper. In a large bowl sift together the flour, cocoa powder, baking powder, baking soda, and salt. In the bowl of your electric mixer, beat the butter and sugar until light and fluffy. Add the egg and beat well. Beat in the vanilla extract. In a small measuring cup, mix the buttermilk and water. With the mixer on low speed, alternately add the flour mixture and buttermilk mixture in three additions, beginning and ending with the flour. Drop heaping tablespoons of the batter onto the prepared baking sheets, spacing about 2 inches apart. With moistened fingers or with the back of a spoon, smooth the tops of the cookies. Bake for about 9 - 10 minutes or until the tops of the cookies spring back when lightly pressed. Remove from oven and transfer to a wire rack to cool completely. To assemble, take one cookie and spread a heaping tablespoon of the filling on the flat side of the cookie. Top with another cookie. Gorgeous! That is such an awesome treat. Whoopie! those pies look delish! I've never tasted any whoopie pies other than ones I've made myself...but you're right. They're more cake than anything else! Love how mix and match they are...I just know that you'll come up with some crazy fun creations now that you've been indoctrinated into the world of the whoopies! These look like the perfect treat to bring to a Memorial Day BBQ! I would love to have one of these right now! The texture looks perfect. These look delicious. Whoopie Pies are fun to make interesting combinations with. Yum! Looks so moist and delicious! god i love whoopie pies!!! reminds me of summers at band camp in maine. Hehe I know what you mean-sometimes I have no idea (apart from lack of time) as to why it takes me so long to make or try something! I have not made nor eaten a whoopie pie before either. I'm feeling pretty inspired to give them a try though now. These look so yummy. nice idea.. thanks for sharing. I have yet to make whoopie pies in my own kitchen, but I am sintered to do so. I've never made or eaten Whoopie Pies either, Grace. I suppose our Southern equivalent is MoonPies, of which I've eaten a few. Ok, I've eaten many, many. With and without RC Colas. I've always thought these should be called whoopie cakes...I mean, there is nothing pie-like about them! In any case ours look delicious. did you ever see the morning glory whoopie pies i made? damn they were good. Beautiful! I've never made whoopie pies, but now I really want to! I agree, Grace. I've always classified whoopie pies as cake. Yours look wonderfully tempting. Love your idea of strawberry butter cream...maybe raspberry would be good too. Those look so good! Why is it the moment I decide to go on a D-I-E-T, I find something that looks this good?! So glad you've joined the ranks of whoopie pie lovers, Grace! Sounds amazing, especially with dulce de leche as filling! This looks so delicious. Chocolate butter cream frosting will certainly make me smile the most. I'm also a big mixer and matcher, so I think I need to get ready to make these as soon as I can. Thank you for sharing with me! I'm glad I stumbled on your blog tonight. I hope you have a great end to your week! Whoo! Pie Pies makes me chuckle too! So much like cake. And that one with the coconut and dulce de leche...swoon. 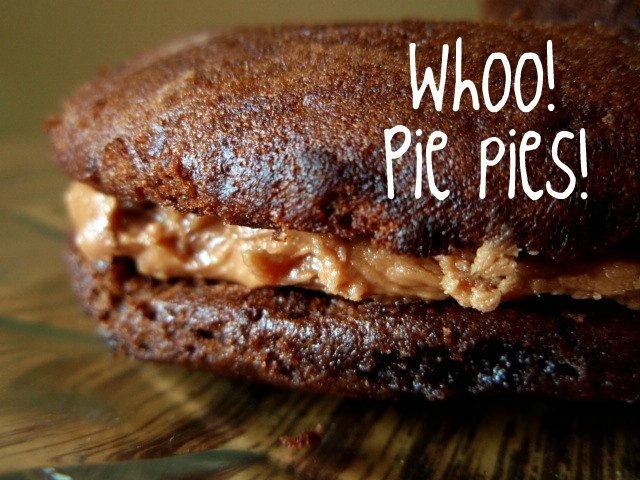 We love whoopie pies, in fact I have some in the oven right now- because I figured out a way to bake them in mason jars- hahaha! My family is going to have me committed!! You've never had one because they're supposed to be a "New England" invention. Yours look great. What's not to love about a personal cake/pie! Especially one with such a fun name! Delectable! And such a fun name too. Love me some whoopie!!! Pies that is. Chocolate always has a spot at my table. Delicious recipe Grace! You are going to be a whoopie addict now!! I love whoopie pies, but always get my little sis to make them, LOL!! I need to try these!! I've never tried one. I must remedy that! Your world is amazing.Thank you for all this information!